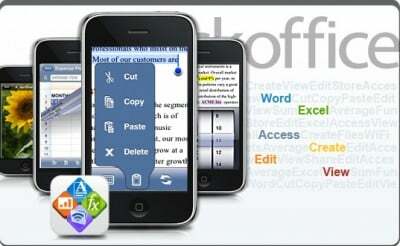 Quickoffice's integrated application is the essential high-performance mobile office productivity tool for anyone on the go. Experience enterprise-grade Microsoft® Word and Excel® Office functionality with leading-edge innovation and unparalleled ease-of-use. Edit important files with confidence; Quickoffice maintains 100% data integrity and guarantees Microsoft compatibility. It was a dark and stormy night, and the full moon lent an anxious glow to San Francisco's Moscone Center, still but for long, wind-snapped banners that read: Welcome to Apple's World Wide Developers Conference (WWDC) 2009. "Hold the presses!" Dieter roared as he burst through the doors of TiPb HQ, iPhone clenched and shaking in his hands. "Presses?" Rene said. "Really? We have this thing now called the inter--"
"Quite youse!" Dieter shoved his iPhone at Rene. "And read." Rene bent forward, took it. "What am I reading?" "Just the scoop of the century." A smile raced up Dieter's face. "Secret source. Top secret. Roof of the world secret. Would you believe that tomorrow, during the WWDC, Apple is going to..."
What?! Don't leave us hanging like that! What is Apple going to announce? Turns out YOU have to finish the story, the conversation. That's right. Don't just tell us, show us: we want action, dialog, drama, suspense, comedy. What's Dieter going to say, and how is Rene going to take it? How's the internet going to take it?! Get your creative juices flowing and two story-tellers will get each get a copy of Quickoffice Mobile Suite absolutely free. Inappropriate or off-topic material will be removed at the sole discretion of the moderators. Now hurry up, get over to the TiPb Birthday Bash: Quickoffice Mobile Suite Give Away forum thread and get writing! I want to know how it ends!